and it goes on and on my friends. I really love the first Clapotis I knit. I still get tons of complements on it when I wear it. And I thought that a large Clapotis would be such a great wrap to use in the office, on those days when the air conditioner turns the place into an arctic deep freeze and I want to call Building Services to inquire if they have heard about global warming, and that maybe, just maybe, in some cases a little of it would be OK.
Clapotis #2 is being knit in Elspeth Lavold Silky Tweed. I purchased a number of skeins. Don’t remember how many now, but enough to make a good-sized wrap. With Clapotis #1 I’d had barely enough yarn to finish — there was less than 6″ left, and I’d had to do some creative decreasing to make it. 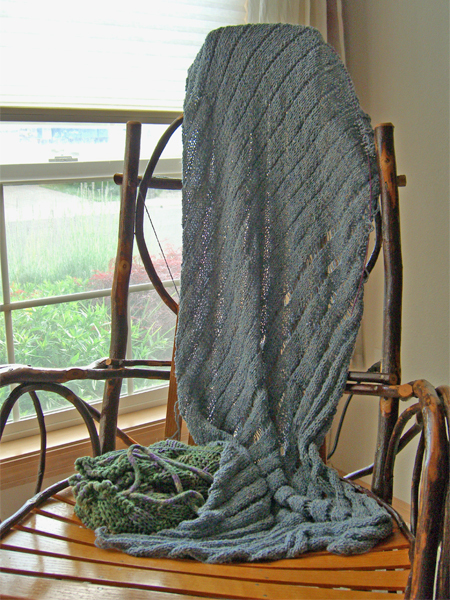 Not wanting to repeat that experience with Clapotis #2, I increased through one skein of yarn. The plan was then to knit the straight part until I had one skein of yarn left. Then work the decreases. I’m glad, now, that I planned it that way because I never would have remembered any other non-standard plan for this long. As we’ve all established, gentle reader, I’m a short-attention-span knitter. I’m pleased to report that, after some decent knitting time yesterday, I’m down to 1-1/2 balls of yarn. I’m a mere 1/2 of a ball away from starting the decreases. There is actually an end in sight. Dare I hope I may actually finish this puppy? The new sock club delivery came yesterday. I have no pictures. I didn’t expect to like every single thing all year. The jury is still out on this one. While this time I do like the pattern, I’m not sure yet about the yarn. We’ll see. I have many things on my knitting mind right now, anyway. I need to start my Sockapalooza pal’s socks really soon. Really soon. and now that it’s summer again, I’d like to knit the cotton bag that’s been in my head for about a year. I am going to attempt to knit some of those UFOs over there and get them off my list. So I can add new ones. You know how it goes.